Splits domain into vector of disjoint boxes with max size maxsize. Blocking factor is default to one. If you make minimum size > 1, then domain must be coarsenable and refineable by blockfactor (refine(coarsen(domain,blockfactor), minsize) == domain) or an error is thrown. 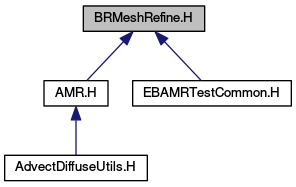 This would be defined in MeshRefine.H, except that it needs to use a BRMeshRefine object. Here a_refineDirs[d] is 1 if refining in dimension d, and 0 if not. Splits domain into a vector of disjoint boxes with maximum size maxsize. blocking factor is default to one. If you make minimum size > 1, then domain must be coarsenable and refineable by blockfactor (refine(coarsen(domain,blockfactor), minsize) == domain) or an error is thrown. This would be defined in MeshRefine.H, except that it needs to use a BRMeshRefine object. Here a_refineDirs[d] is 1 if refining in dimension d, and 0 if not. Recursive function to enforce max size of boxes in a given direction. Does not call Meshrefine.